Please come and join the celebration of the 100th Anniversary of the building of Tor House at the annual Tor House Spring Garden Party. As they had carved in the mantle in Una’s room in Hawk Tower “Ipsi sibi somnia fingunt” — “We fashion dreams for ourselves.” Come and experience their dream for yourself. 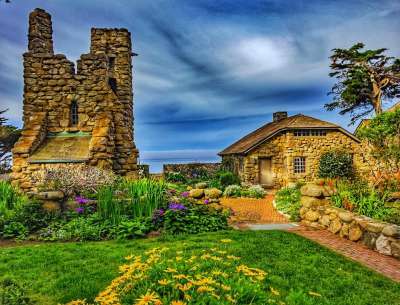 Each year on the first Sunday in May, the Tor House Garden Party brings together admirers of the wild coast of Carmel, historic buildings, and of course, the poetry of Robinson Jeffers. You can enjoy an afternoon (2 – 5 PM) of perusing the granite home and Irish-inspired tower that Jeffers built as he crafted his remarkable dramatic poems. As you walk the Tor House spring gardens, perched on the edge of Carmel Bay, you’ll be enchanted by musicians, plein air painters, and knowledgeable docents who reveal fascinating details of America’s great poet, philosopher, and environmentalist, as well as the remarkable life he shared with his wife and muse Una. Delightful homemade petite treats and refreshments are available in the garden and tea is served in the Jeffers’ dining room. The Garden Party is also a special day for photographers as it is the only time you can take pictures inside Tor House for your personal memories. A climb to the top of Hawk Tower provides inspiring vistas of the pounding Pacific Ocean and the fabled beauty of Pt Lobos. Under the influence of this magical venue, perhaps a poem of your own will come to mind to capture the perfect moment forever. You’ll want to return soon for your own docent-led, in-depth tour. Admission to the event is $15 per person. Children must be over the age of ten. Please, no pets of any age. Tickets are available online at www.torhouse.org, or at the party; cash and credit accepted.